The Attribute Tab provides you with tools to view, modify and alter data pertaining to any one InfoSWMM SA element such as a pipe, junction, valve, pump, tank and/or a reservoir. It provides also a quick means to inspect output data relating to that element. 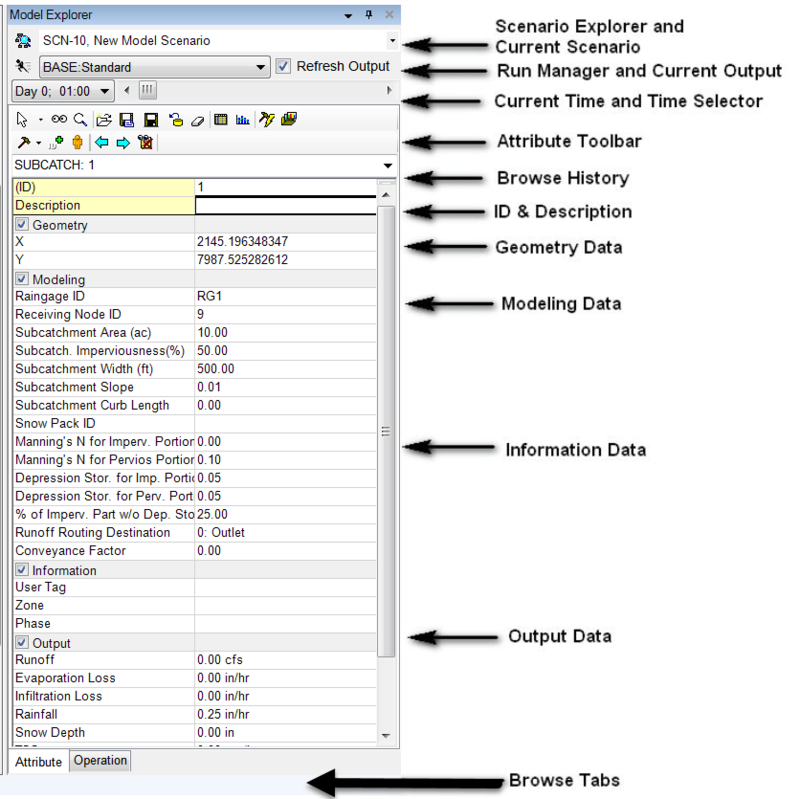 The Output data section is available only after a successful model run. Additionally other features allow you to locate (search) elements, create default values and assign specific values through the Tools menu. Scenario Explorer and Current Scenario – Contains the toolbar button to access the Scenario Explorer and displays the pull down menu to select the current active scenario. Run Manager and Current Output – Contains the toolbar button to access the Run Manager and displays the pull down menu to access the current available output and the refresh selector. Check the box to refresh the current output. Run Manager – Use this button to launch the Run Manager dialog box. Click here to learn more about the InfoSWMM SA Run Manager. Change Output – The change output drop down is used to select a previously created output and make it the active simulation Output. Refresh Output Data – When checked this will automatically refresh your output data after every simulation run. Time – Displays the presently selected simulation time on the toolbar. Time Bar – Use this to specify the time for an EPS run. Drag the slider to the desired time or use the Forward and Back arrows to move one timestep at a time.Current Time & Time Selector – Displays the current simulation time of the output displayed and includes a slider to change the current output time. Browser History – Lists the history of the elements that have been displayed in the Model Explorer – Attribute Tab. Use this list to return to any previously displayed element. ID & Description – Displays the ID of the element presently highlighted in the InfoSWMM SA project and the Description. The data corresponding to this element is displayed in the rest of the Model Explorer – Attribute Tab. 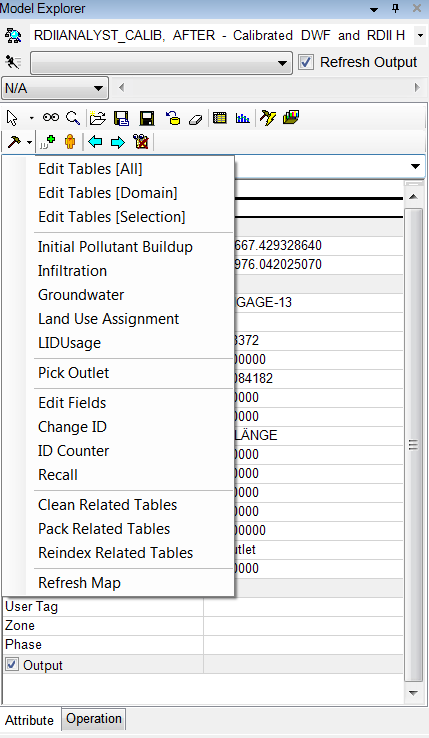 You may also select another element in the InfoSWMM SA project by just typing in the new ID and clicking on Enter. You can also add or change the description. Geometry Data – All the Geometry Data for the element is displayed here. You may modify or alter any or all the data. For Pipes you may reverse the pipe downstream node and the upstream node by clicking on the Reverse button. Click here to learn more about Geometry data. Modeling Data – All the modeling Data for the element is displayed here. You may modify or alter any or all the data. Click here for more information about the Modeling data. Additionally double clicking on “Minor Loss” will bring up the Pipe Minor Loss dialog box. Information Data – All the information Data for the element is displayed here. You may modify or alter any or all the data. Click here for more information about the Information data. Output Data – This section displays all the output variables for the active Data element. This section will only contain results after a successful Simulation Run. The Output is also available in graph and Table format from the Output Report & Graph Dialog Box. Browser Tabs – The Browser Tabs select the browser’s function, See: Operation Tab, Annotation Tab and Contour Tab for details. Attribute Tab: The Attribute Tab displays the element attributes for the model data elements. Operation Tab: The Operation Data tab contains all of the operational features of InfoSWMM SA. Click here to learn more about the Operation Data feature of InfoSWMM SA. Note: The check box on the heading line of the data sections controls the visibility of the data section. If the check is removed, the data will not be visible.